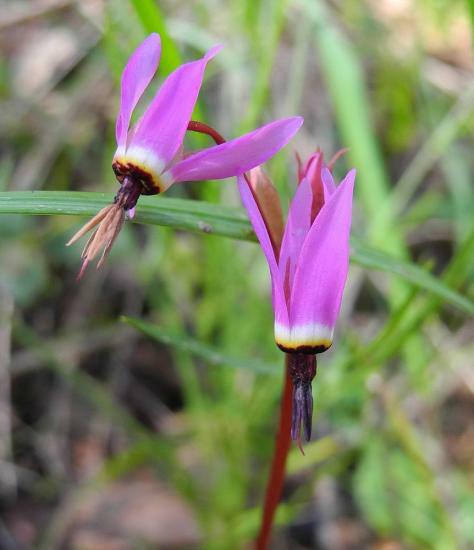 Dodecatheon, widely known as "Shooting Stars," look a bit like miniature Cyclamen, but with projecting anthers that give the flowers a pointed look. They are widespread in North America, extending from northwestern Mexico to northwestern Canada, Alaska and also part of northeastern Siberia. Species have basal clumps of leaves and nodding flowers produced at the top of tall stems. 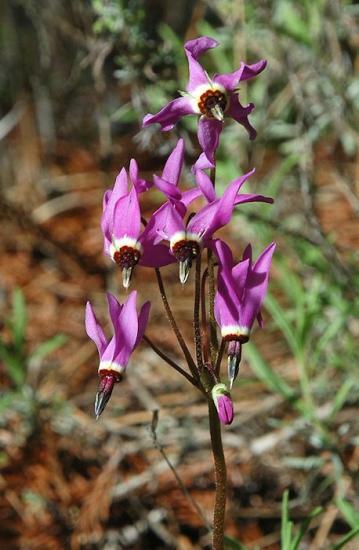 In this wiki we include species that go completely dormant for part of the year and can be grown like bulbs. Rhizomes or caudices are usually present with fibrous roots and sometimes bulblets. The caudex is generally short-lived in most species and may or may not be obvious when the plants are dormant. Species are buzz pollinated by large bees. 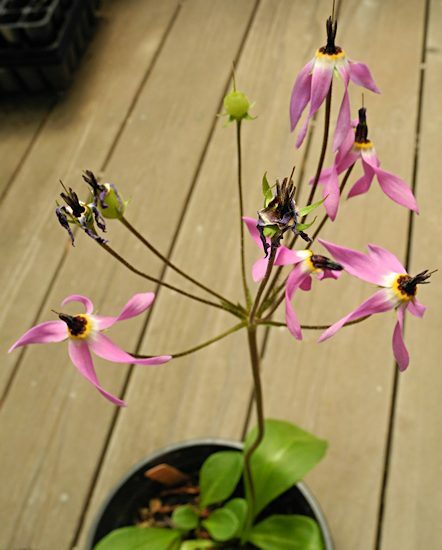 Dodecatheon is a genus of herbaceous perennial plants in the Primulaceae family. It is notoriously difficult taxonomically as the differences between the species are subtle and there is great variation within the species. One of the things to look for is whether the anther connection is smooth or wrinkled. 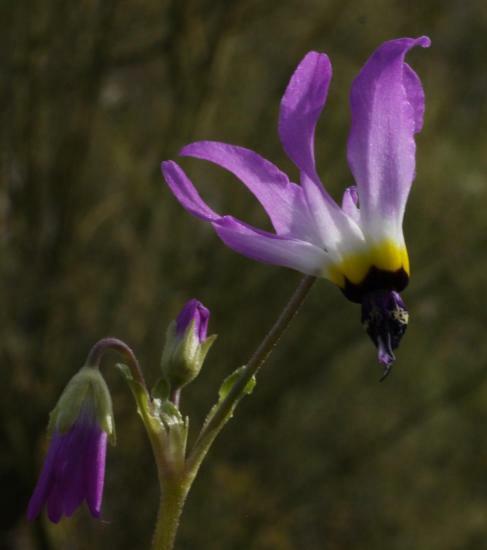 In addition this genus is now proposed to be included in Primula. 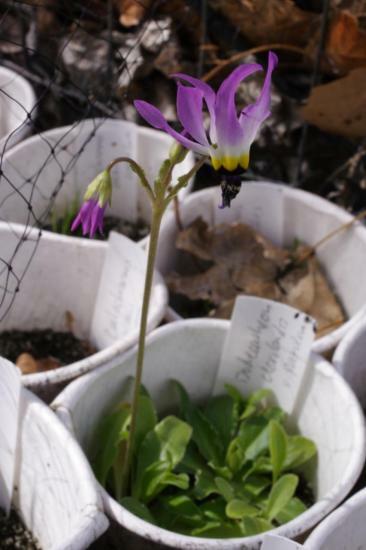 For more information on this genus and the reasoning behind this change see Revision of Dodecatheon by James L. Reveal. 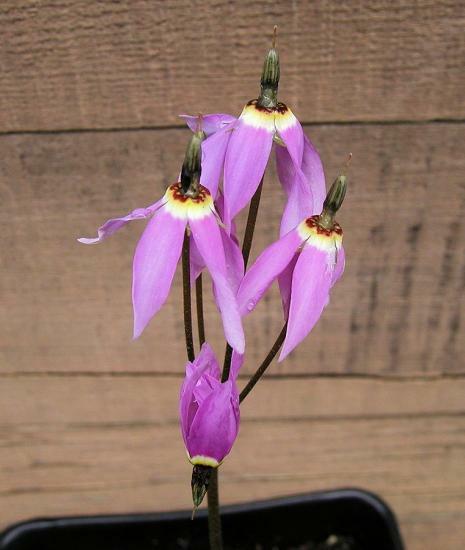 Dodecatheon clevelandii ranges from central and southern California to northern Baja California. 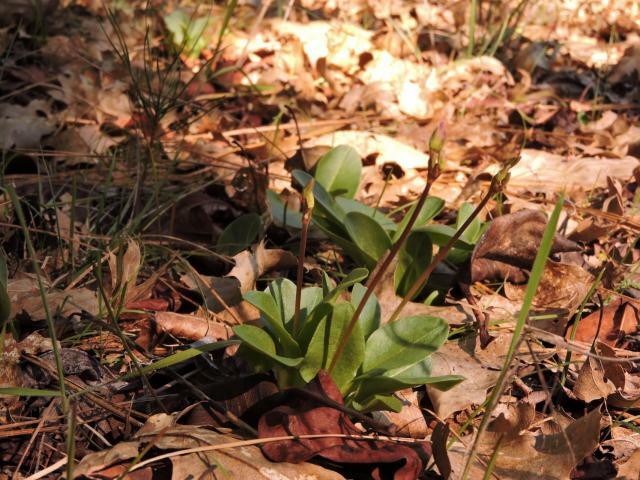 The plants grow in areas that are completely dry for five or six months in summer and fall, and they disappear underground during summer dormancy. In cultivation, they do well in pots, and can be grown in the same conditions used for summer-dormant bulbs. They will also reportedly tolerate some summer water if grown in very well-drained soil. When dormant, the roots of this species are brittle and spider-like. They must be handled very gently to avoid breaking the roots. There are several varieties of this species, distinguished by the colors of the anthers and pollen sacs. This plants photographed here are apparently ssp. patulum. They are second-year seedlings growing in a paper coffee cup. Photos by Michael Mace. 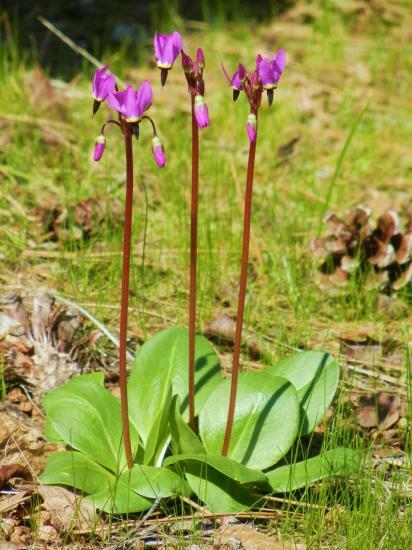 Dodecatheon hendersonii is a species of grassland communities and oak and conifer woodlands where it is found in sunny or often shady places. It occurs from British Columbia, Canada, south to California. 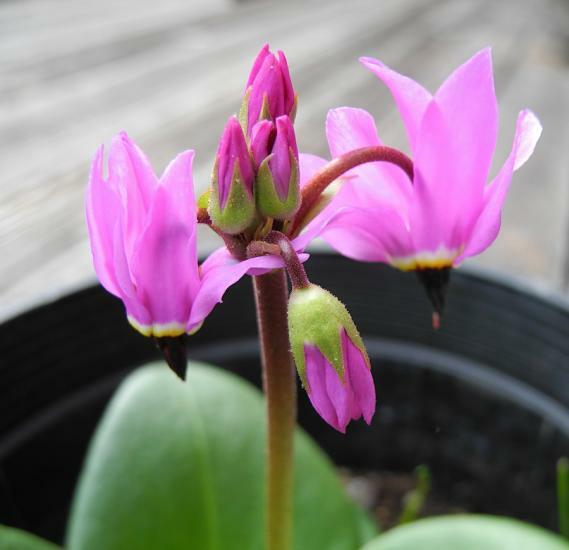 Common names are Henderson's shooting stars and mosquito bills. 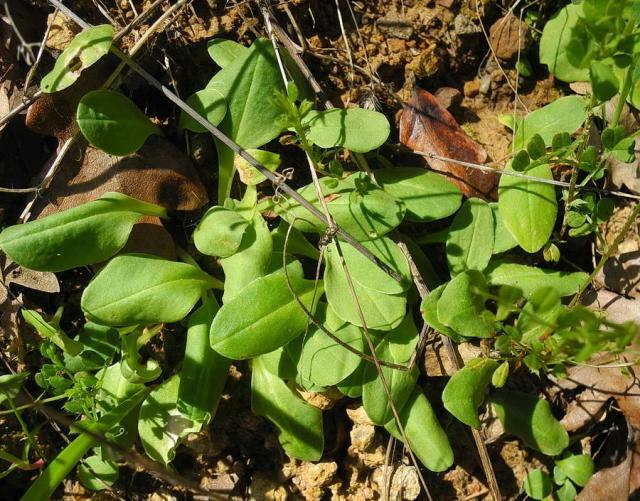 Spoon shaped leaves are in a basal rosette and appear in winter. 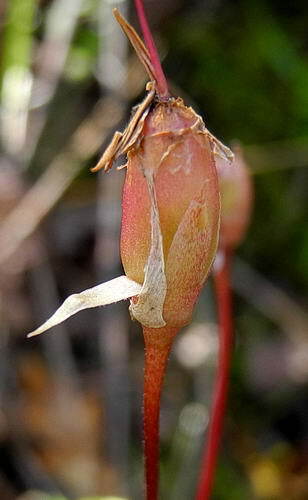 This species flowers in early spring and then dies back when the rains stop (late spring to summer). The flowers are inside out with magenta to lavender to white petals and a yellow or whitish tube with a thick, wavy, reddish to reddish-purple ring. 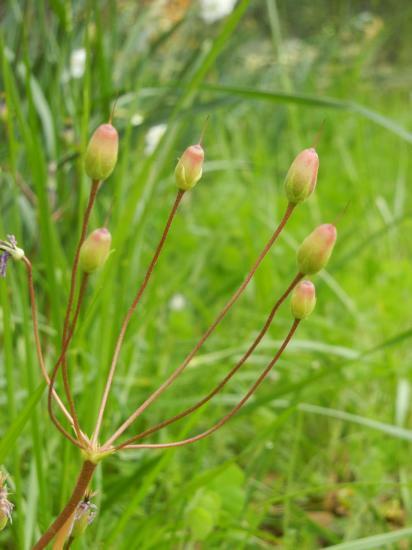 They appear on top of a tall 12 in (30 cm) leafless flower stalk. The flowers are pendant when they first open, then turn upwards once pollinated. The seed capsules form small upright cups that hold the small (poppy seed size) seeds. When the wind blows or the dried stems break, the seeds spill out. This also makes seed collection easy, just pick the dried scape and spill the seeds into a container of some type for storage. Richard Haard in a PBS list post reports that the offsets around the crown can be harvested to form new plants. Travis Owen reports that it is easy to transplant in the fall before the vegetative cycle begins. Any rhizomatous sections that accidentally break off can be planted and will form mature plants in a few years. Mary Sue has some planted in the ground and others grown in a pot moved to the shade in summer and not watered until it naturally starts to rain sometime in the fall. Photos below were taken by Mary Sue Ittner showing the plant in various stages from bud to fruit. 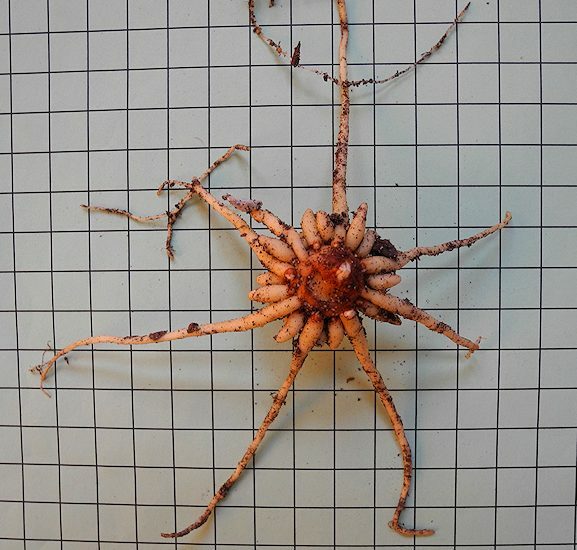 The last photo of the rhizome and roots on a 1 cm grid was taken September 2013 several months after the plant had gone into dormancy and kept dry. Photos from Mary Sue Ittner were taken March 2016 where it was growing in Sonoma County, California on the bank on a shady forested road. Photos below by Travis Owen of plants in habitat under Arbutus menziesii, Pseudotsuga, and Pinus trees, and among various grasses and herbs like Antennaria. 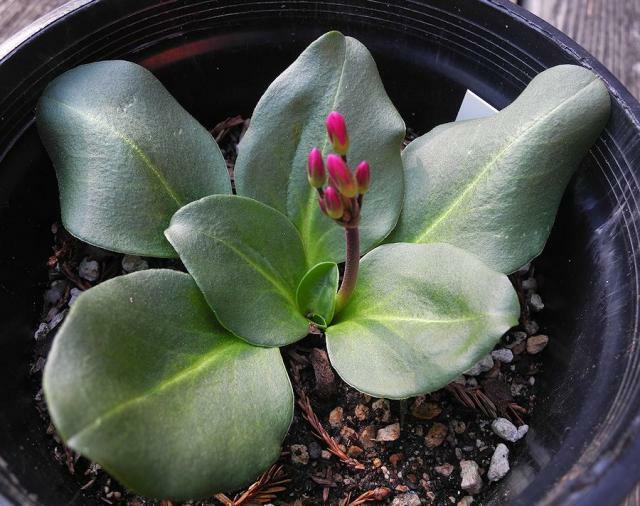 First photo shows plants in bud, mid February 2015. 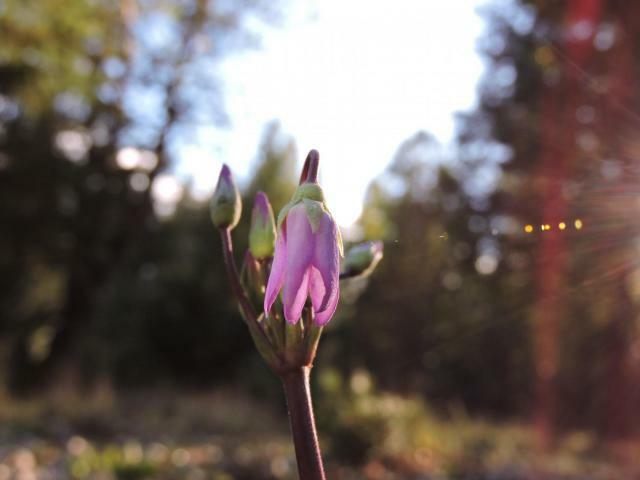 Second photo shows the first flower opening in late February, 2015, note that the petals have not yet reflexed. Third shows mature plants under a pine tree. Last photo shows ripening seed pods, still colorful and beautiful. What is left of the stigma will pop off when the seeds are ready, creating a small urn that will spill the seeds when they are mature.